Vinyl bowls?… Yup, once more, just one day (Feb 10th) after her gun photoshoot in Blog 126 (Feb 9th), Lisa appears in yet another impromptu photoshoot! This time, she’s in my kitchen, heating old vinyl records in the oven to mold them into funky-looking bowls for gifts… Not only that, thanx to Lena and her amazing night-club photos, I was inspired to attempt my own HDR (high-dynamic range) photo-editing experiments… What do you think? 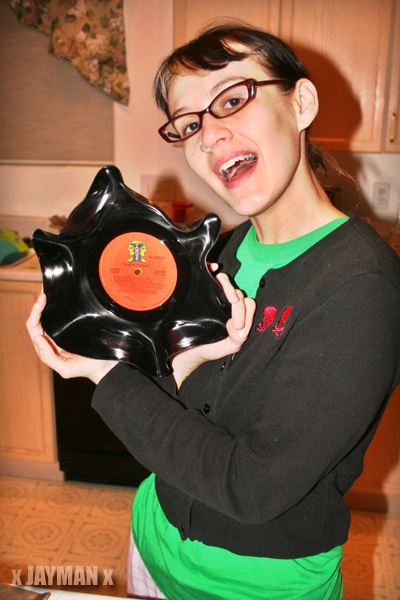 Enjoy the rest of the vinyl-inspired wackiness, lol. Posted in Experiments, Friends & Family.